The majority of common BOPET film stretching lines have an extrusion system for melting the resin. By applying direct film casting technology (DFC) the main extrusion is made obsolete, because the poly-condensation plant is connected directly to the film stretching line. Some smaller, older lines for PET film production have in fact been using this technology since the 1970s. 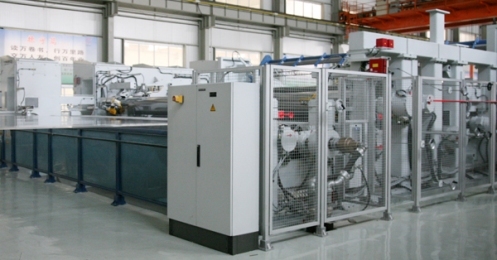 Recently the major Chinese film producer Jiangsu Shuangxing Color Plastic New Materials Co., Ltd. and Brückner Maschinenbau rang in a new era by commissioning four large DFC lines with a total annual output of more than 125,000 tonnes. All these four lines started extremely smoothly and since then have been producing high quality film for the market very stable. Both teams have mastered perfectly the integration of poly-condensation and stretching line – and Brückner’s advanced process automation ensures flexibility when it comes to product changes. Within the highly competitive Chinese BOPET markets the DFC technology gives Jiangsu Shuangxing a number of advantages: lower energy consumption and considerable savings in transport, logistics and personnel costs – a clear reduction of the overall production costs. These DFC lines represent another highlight in the long series of ambitious joint projects by Jiangsu Shuangxing and Brückner, demonstrating clearly that solid entrepreneurship, technological expertise, experience and a sound cooperation result in a competitive edge for Brückner customers.